Welcome to the official LCGB Website. The World's biggest Lambretta club by miles. 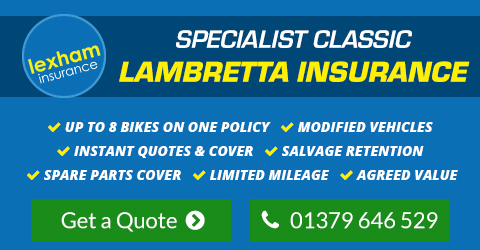 Everything you need from purchasing to running or restoring your Lambretta is available within the LCGB. For further information on joining and enjoying the benefits, click HERE for details. The sponsorship for 2019 is in memory of Kev Walsh, ex General Secretary of the L.C.G.B. This video was made by Mike Oxley, an LCGB member who does not get any commercial gain from his videos. If you would like to see more of his scooter videos or get notifications when new ones are uploaded, visit his youtube site where you can subscribe: https://www.youtube.com/channel/UCtsb2-Ef0yW9h9c_ZtMtr2Q/feed or join the SCOOTERS AND RIDERS group on Facebook. Dating Certificates help you with DVLA. For full details of all the benefits of LCGB membership, click here. LCGB Merchandise available for you to buy. LCGB Memorabilia from 1953 to Present for you to view. An in-depth restoration guide from start to finish.